Ahh...sticky toffee pudding. The name was enough to make me a fan even before I tried it. I was in Edinburgh for my best friend's wedding the first time I ordered it. It was August and when we stepped out of the airport that first morning I realized that I had packed all the wrong things. I'd known that the UK would be a bit cooler than NY, but wasn't aware of just how much cooler that would be. It was gray and raining and I was freezing, so our first plan of action involved purchasing an entire new wardrobe of thick wool sweaters, tights, closed walking shoes, and a trench coat. Once we'd checked into the apartment we'd rented, I shoved the breezy maxi dresses, light cardigans, and strappy sandals to the bottom of my suitcase. But all the sweaters and coats did very little to keep me warm in the pervasive dampness. The weather made me feel constantly cold and cranky, and consequently, all I wanted to do while there was eat rich, cozy things. Fortunately, that is one thing that Scotland does very well. I fell in love with the food: bubbling pots of lamb stew, double-cream on scones, piping hot and fat chips fresh out of the fryer, bacon sandwiches, banoffee pie, haggis, absolutely all of it! And for dessert? 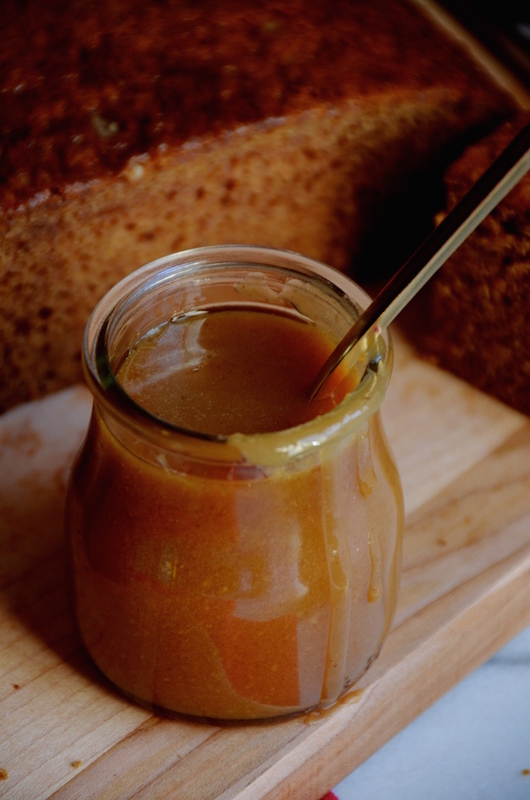 Sticky toffee pudding! A hot square of cake served in a puddle of steaming toffee sauce, perhaps with a bit of cream or custard on the side, was the icing on the admittedly already rather rich cake. I ate it everywhere I saw it while I was there, and have done the same ever since. 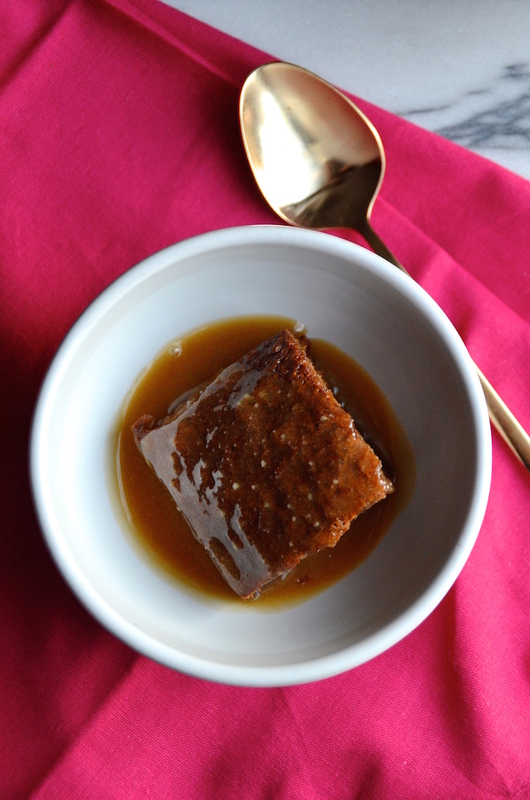 If there is sticky toffee pudding on the menu, you better believe that I will be ordering it. 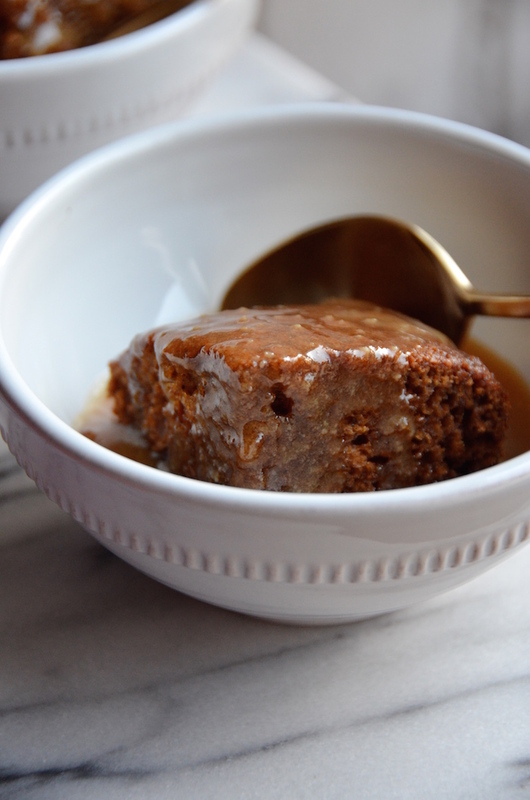 If you're wondering about the details, it's as simple as this: a moist date cake topped off in a buttery brown sugar caramel sauce (butterscotch, basically). 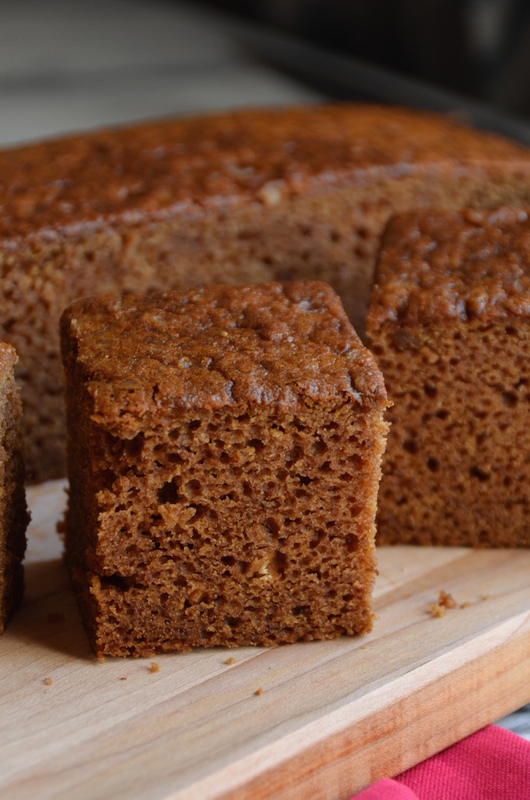 There are many variations with some cakes that seem very moist and pudding-like (like a bread pudding) and others that are a bit more like a cake. This one is something in between. I also added cozy touch by steeping the dates in tea instead of regular water. I was inspired by a Russian-style cake that my husband's aunt made us one year, and thought the touch worked well with the dates. If you don't like tea, you can skip it and just use an equivalent amount of hot water. It's served hot, either freshly made, or reheated gently before serving. It's one of those desserts that just feels old timey and comforting, and like something straight out of a novel. It's a perfect winter dessert, and the kind that can be made in advance and reheated as needed. I hope you'll give it a try. Remove the pits from the dates, then chop coarsely. Place in a bowl and top with the hot tea. Let soak for at least 30 minutes, or until dates are soft. Preheat oven to 350 degrees. 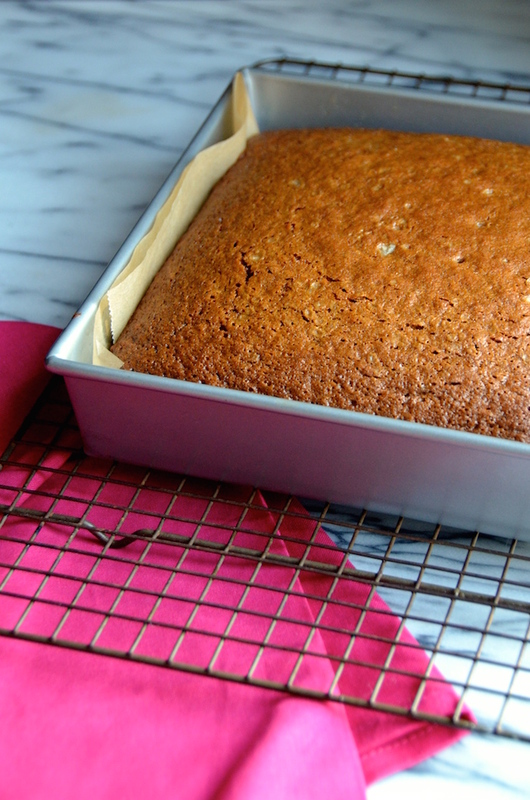 Grease and line an 8x8” square baking pan with parchment paper. Pour the dates and tea into a blender and puree until smooth. Place the butter in a small saucepan over medium heat and let simmer for about 5 minutes, until melted and slightly toasted (it will smell nutty). Pour this melted butter into the date puree in the blender. Add the sugar and molasses, and puree again for one minute. Add the eggs, salt, and baking soda, and puree until smooth. Pour the date and egg mixture from the blender into a large bowl and add the flour. Stir until smooth and evenly combined, then pour into the prepared baking pan and bake about 25-30 minutes, or until a toothpick inserted in the center comes out clean. While the cake bakes, make the sauce. Combine the butter, cream and brown sugar into a medium saucepan over medium heat, and bring to a simmer. Use a whisk to stir as it cooks, about 5-7 minutes or until thick. 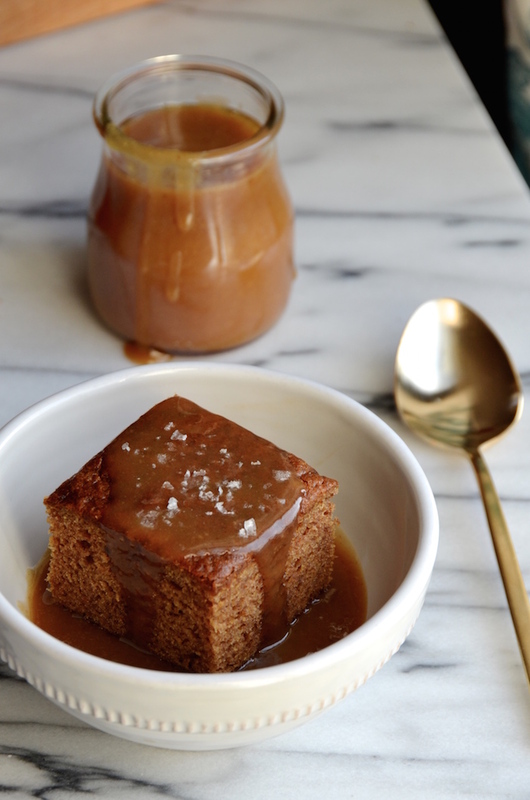 To serve, top squares of the cake with the toffee sauce. Sprinkle with a bit of salt on top, if desired.